It was a weekday evening. While I was washing the dishes right after dinner, it occurred to me that I have not prepared anything for breakfast for the next day. There were no homemade cakes or bread and I would rather stay at home than to step out of the house to get a loaf of bread from the neighbourhood bakery shop, which is just a stone's throw away. The only way out was to bake something quick and easy. I guess nothing beats a batch of muffins when you are running short of time. I checked the ingredients I have on hand and managed to match the list with those found in this recipe for a batch of Banana & Chocolate Muffins. The recipe calls for chopped plain chocolates, I replaced them with chocolate chips as I rather save the chocolates for baking a cake or to use it to make chocolate ganache. The recipe calls for self-raising flour, and since I didn't have that, I substituted it with a mixture of plain flour, baking powder and salt. When I was all set to begin my baking session, my younger child came to the kitchen. When he saw me getting busy with the preparation of the ingredients, as usual, he offered to help me. Unlike his elder brother, he always doesn't seem to mind dropping whatever he was doing, just so he could have some fun playing with flour, butter and eggs. I got him to mash up the bananas while I measured the other ingredients. He found immense pleasure in adding, pouring ingredients into the mixing bowl and eventually stirring them, even if he was only allowed to give a few strokes. Without fail, he asked whether he could do the final mixing of the wet ingredients to the dry ones. Since he was so enthusiastic, I told him he could do all the stirring this time. While he was half way into the mixing, I thought I should capture the moment on video. I got him to pause for a second, while I dashed off to grab my camera. Here's a very short video clip of him mixing the muffin batter...as the batter got more and more heavy for him to stir, I took over to finish up the job. In case you ask, it was my elder boy who taught me how to use Window's Movie Maker to do the editing of the video clip. Otherwise I wouldn't even know the existence of such a software. As you can see from the video, I stopped mixing once the flour mixture disappeared into the batter. The batter was very thick and lumpy. To get very soft and fluffy muffins, it is very important not to over stir the mixture...this is especially so for recipes when the instruction calls for mixing the wet ingredients to the dry ones. Very soon, we were rewarded with ten sweet-smelling, beautifully domed muffins. While the muffins were cooling off, my little one kept asking when he could eat the muffin. He had earlier devoured a banana and a bar of Kit Kat while the muffins were in the oven, and yet he couldn't wait to lay his hands on the muffins. Once I gave the go ahead, he sat down alone at the dinner table and enjoyed the freshly baked muffin he made. The muffins tasted really delicious when they were fresh out of the oven. The texture was all moist and fluffy. I cut down on the amount of sugar and the sweetness was just right. The photos of the muffins were taken a day after, I think it didn't capture the soft and fluffy crumbs that well. Nevertheless, they tasted as good when served warm. This recipe is going to be a keeper. Pre-heat oven to 180degC (350 degF). Line muffin pans with paper muffin cases. Sieve together flour, baking powder, baking soda and salt into a mixing bowl. Mix in the chocolate chips. Set aside. Peel the bananas and mash with a fork in a bowl. Add in brown sugar, egg, milk and melted butter. Mix until well combined. Pour the liquid mixture into the dry ingredients. With a wooden spoon or a spatula, gently fold all the ingredients to form a wet batter. Stir gently, using only a few strokes and mix until the flour are incorporate into the batter. DO NOT Over mix. The batter should appear lumpy. Spoon batter into paper muffin cases. Bake for 20mins until muffins turn golden brown or a toothpick inserted into the centre comes out clean. Let cool on a wire rack. Serve warm or cold. Recipe source: adapted from Good Housekeeping - Easy to Make! Cakes & Bakes. hmm smell nice .. banana and chocolate never go wrong together hor. Btw, just like to find out from you if you know where can I get 孟老师 series of books in singapore? I finally got hold of the cake book and it is so tempting to own it. I just renewed the book. keke. Yum! I love anything that combines banana and chocolate! Yummy! Definately smell nice and delicious! Wonderful photo shooting too! You've multi talents! thanks for the video and precise instructions! I finally made it... after many failed attempts of making muffins. chocolate and banana or chocolate and hazelnuts are like matches made in heavens man. gotta try this recipe one day! oh btw.. i posted my everyday bread post le. have a look when free yea! I could even smell it here! And so nice of your younger one to help out. Perhaps his career has been crafted! How funny! I just posted on Peanut Butter, Chocolate, and Banana muffins today. I'll go ahead and a link to yours right now. They look delish! Do you think I could just bake it as a cake instead of dividing the batter into muffin cups? 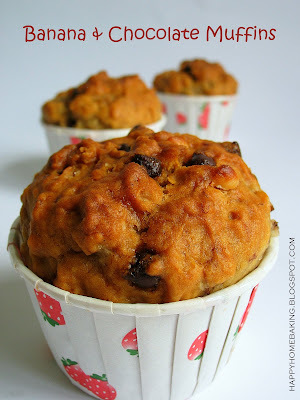 I made banana chocolate muffins this weekend (but i haven't blogged about them yet)! love the video! Hi Sherlyn, you may try Kinokukniya for the books. Meg, I love bananas with chocolate too! Hi Paulene, I can't wait to hear good news from you! Katherine, Congrats on your successful attempt. I really admire your never-give-up attitude! Family First, hahahaha, he won't be a baker, he wants to be a policeman when he grows up. He has been training very hard...he plays catching "police & thief" everyday in school!! Hi Nich, I am not really sure as I have not tried it...you can give it a go, but you will need to bake it for a much longer time...at least 30-40 mins or even more. Thanks very much for remembering me when posting the video. I really appreciate it. I made another batch on Sat and replace the chocolate chips with 1 teaspoon of crunchy peanut butter... it taste so good! My younger boy finally eat the muffin this time. 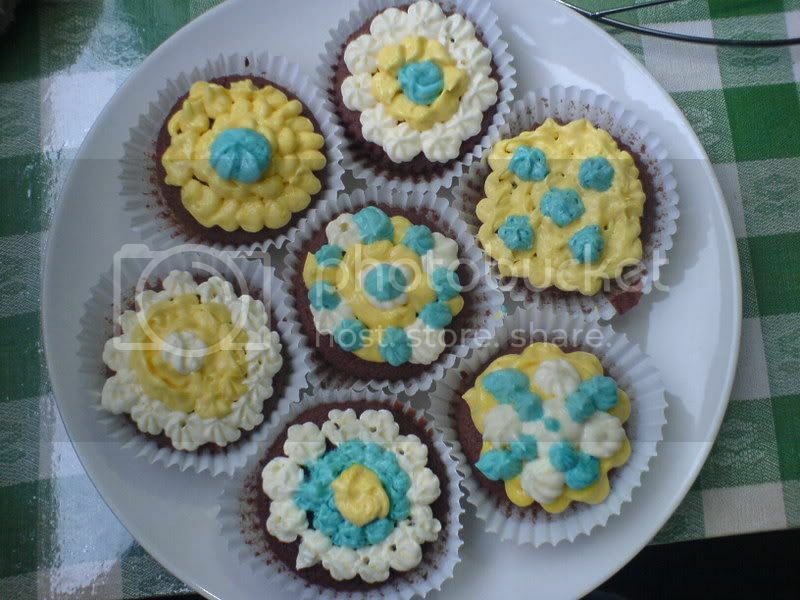 Hi Fion, once you get the hang of it, you can create your own muffins to suit your taste. Glad to hear that your boy finally eats your muffins :) It is good to get kids to expose to a wide variety of food. Hi there, I'm a home-baker wannabe for years, but have procrastinated for a long while cos I've always felt that I have to purchase lots of equipment and ingredients for baking. I have a boy who loves bread and pastry. Hope to learn some simple receipes to start with! I have a microwave oven that has convection function. Will this work for baking? Re: muffins, instead of using paper cups, any problem with using the muffin tray, and do i need any adjustments on the baking process? Hi Trina, Sorry, I'm afriad I'm not able to answer your question about the microwave oven as I have not use it before. I made these muffins and they came out perfectly. I blogged about them today - all credit to you! Hi Peg, I can't wait to hear about your muffins! Happy baking! if i have self-raising flour, i just leave out plain flour, baking powder and salt? how about baking soda? I dont know which part that i did wrong 450g of bananas take me about 4 1/2 bananas umm and I dont know I put all the liquid ingredient at high speed about 2 minutes I guess is it too long? Hi wa, it is stated in the original recipe, to use 450g of bananas (3 large ones)...and I weight them with the skin on....which is about that weight. Did you measure with the skin on? The other likely cause could be your oven temperature...did you preheat it? is your oven reliable? My oven temperature is always not stable, I had to rely on an oven thermometer to check. You may have underbake the muffins...ie baking at a low temperature, and so the middle is still sticky. You can test for doneness by inserting a toothpick or skewer into the centre of the muffin, it should come out clean and not sticky. 2. Stir together the flour, baking powder, salt and sugar in a large bowl. Make a well in the center. In a small bowl or 2 cup measuring cup, beat egg with a fork. Stir in milk and oil. Pour all at once into the well in the flour mixture. Mix quickly and lightly with a fork until moistened, but do not beat. The batter will be lumpy. Pour the batter into paper lined muffin pan cups. 3. Variations: Blueberry Muffins: Add 1 cup fresh blueberries. Raisin Muffins: Add 1 cup finely chopped raisins. Date Muffins: Add 1 cup finely chopped dates. Cheese Muffins: Fold in 1 cup grated sharp yellow cheese. Bacon Muffins: Fold 1/4 cup crisp cooked bacon, broken into bits. 4. Bake for 25 minutes, or until golden. i stir in da egg with da flour and all as i didnt know it should be stir in with da milk and oil..was it da cause?? Hi Audris, you will need to mix the egg, milk and oil all together in a bowl before adding this liquid mixture to the dry ingredients. I checked your blog, it seems like you didnt fill your muffins liners with enough batter, and with this type of paper liners, it is best to use them to line a muffin pan, which will provide some support otherwise you will not be able to add too much batter into the liner. I suggest you get those muffin paper cups instead, they are more sturdy and you dont need to use a muffin pan. I suspect your oven temperature is not right, the top gets cooked while the middle is still raw. Did you preheat your oven to the right temperature? It will usually take about at least 10mins to preheat the oven. I use a desktop electric oven too. The other thing to note is the position of the oven rack. If you place it too near the heating element (which is on top?) then the top will get browned faster. Since every oven works differently, you will have to test it out to see how it works. To tackle the problem of hot spots (some part of the oven is hotter than the rest), you can turn the baking tray around about 5-10mins (adjust accordingly to your oven) closer to the baking time to ensure even browning. Hope this helps. This recipe was a success! I added more choc chips and sprinkled flaked almonds on top before baking! Going to make these again when I have over riped bananas! I kinda adjusted your recipe, I hope you don't mind. Hi Grub, your muffins look so good!! and do feel free to adapt the recipe. hi, i would love to try this recipe as I am new to baking. Just like to check with you on the mixing of wet ingredients, when you mentioned "mix until well combined", do you mix using an electric mixer or just a hand whisk? Hi Jo, I used a manual hand whisk to mix the wet ingredients together...there is no need to use an electric mixer. Happy baking! 1 problem I had is that my oven can only take 1 tray with 6 muffins at a time, so the rest of the batter have to queue for their turn and their dome turns out not as crumbly and appetizing as those in the first batch.. any reason for that? Also, is there any rule of thumb when it comes to the ratio of wet-dry ingredients? I also see some recipes says add sugar into the wet mixture, some says mix sugar with flour.. what difference does it make? *hearts your blog/pics/recipes ^^ *thumbs up! Next stop, Choc-Raisin muffins! Yes, the muffin batter cannot be left to wait (most cookies are ok). The reason is, for most baking powder or baking soda, once it is mixed with liquid, they will start to react (chemical reactions...gives out carbon dioxide), the reaction will continue further during baking. So, once the batter is mixed, it should be baked immediately...otherwise the muffins will not expand to much. May I know what is the function of Baking soda & Baking powder in this recipe? (I aware atmost all the recipes of banana cake, the ingredient of baking soda will added in) If without the baking soda and baking powder, what will happen to the cake? Hi Anonymous, baking powder and baking soda are chemical leaveners which help to make the batter expand and rise to form a cake during baking. Baking soda will react with ingredients that is acidic, eg yoghurt, lemon juice, etc. However, even though ingredients such as eggs, may not appear to be acidic to us, it still has got some acidicity to react with the baking soda. To find out more on this, you may refer to baking sites such as joyofbaking.com or baking911.com. i am using your recipe for my Food and nutrition exam, hope it turn out good! thanks for the wonderful recipe! bless you. Hi A, it looks like the problem lies with the oven temperature. Did you preheat your oven before baking? Maybe you can adjust the position of the rack (raise it higher, nearer to the heating element?) so that the top of the muffin gets brown. Also did you adjust the sugar amount? Sugar in baking helps to brown the cakes/muffins, if you use too little it may affect the browning. Hope this helps. I used 100g of brown sugar as well, and placed the muffins as high as possible in my oven but enough to allow rising of the muffins. My oven does not have a preheat function, so I just put it to bake at 210 deg cel for about 20 minutes (or however long I took to prepare the batter), then I popped it into the oven and adjusted it back to 180 deg cel for 30 minutes. Comments from my friend were it was not sweet enough, as the bananas I used were not very ripe. And the top of the muffin feels/look sticky. She also commented there was a flour-y taste. Hi A, looks like you have preheat your oven. Preheat refers to switching on the oven prior to baking at the required temperature so that when the cake is ready to go into the oven, it will be baked at the right temperature. However, seems like your muffins were not cooked thru if there was a floury taste. I think it is still due to oven temperature. Do you have an oven theremometer to check the temperature? Yes, you need to use very riped bananas, the skins should be filled with brown speckles. hi, tried ur banana choc muffin recipe and yes i agree, its almost foolproof even for a new baker like me. 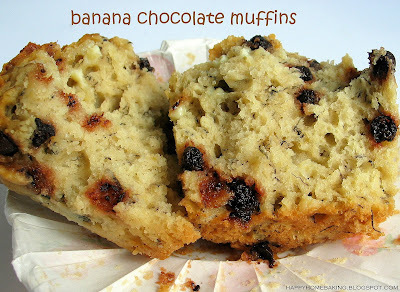 since i love bananas i added to close 500g of bananas and simply love the moist texture of the muffin. tks for the great and easy recipe. Hi i love to view ur blog which is so'sumptuous'!! I have a question here regarding the proportion of this banana chocolate muffin recipe. As my family don't eat muffins, i dont want to make too many muffins. Is it possible to just divide the proportion of the ingredients by 2 or there is specific proportion to get about 5 muffins?? Hi, I am not sure how to divide the portion as I have not tried it. I won't advise you to do it as it may affect the final outcome. Maybe you can make the full portion, and freeze half of the muffins? Oh that's a good idea too. But will it affect the taste if i freeze the batter? Hi, no, you dont freeze the batter. You can use up all the batter to bake the muffins, and freeze the muffins. Thanks homebaker! I have tried this recipe with success : ) My kid and husband love it! I skipped the baking soda cuz i dont have it...it taste alright but didnt rise very high as i want it to be. I wanted to buy baking soda, but the instructions on the bicarbonate of soda stated its for cleaning the floor and dishes??? is it the same thing? I dare not buy cuz it didnt mention anything about using it to bake! Hi Happy Homebaker, I like your blog very much. I am trying to bake a birthday cake for my hubby. Do u have any recommendation? Hi Muffin Lover, sorry for the late reply as I was away. You can use a spatula to fold in the dry ingredients with the liquid. As shown in the video clip in this post, fold gently using the spatula and stop mixing just when the flour disappears. Remember to lift up the batter with the spatula from the bottom of the mixing bowl, this will help ensure there is no trapped flour. 2 oz of butter is about 56 grams. Hope this helps. Hi Lilacz, you can get baking soda from the baking section, which comes in smaller containers. Yes, besides baking, baking soda can be used for many other purposes, for cleaning, clearing chopped drainage pipes and even use it for cleaning washing machines. I am really not in a position to make any recommendation to the type of cake to bake. It depends on your hubby's liking, if he likes chocolate, you can always bake him a chocolate cake (as seen in my post 'Chocolate Lover's Cake'), or you can try an ice cream cake (Oreo Ice Cream Cake)? or a Tiramisu? hi, i've been baking off and on very occasionally for the past few years, and i really want to be good at it. However, my revolving convection oven seems to bake unevenly and can't reach the bottom even after i turned it around, especially the brownies. Im thinking of getting a new oven that would work well what would u recommend?? Hi,may i know whether if i could replace the baking soda with more baking powder and the brown sugar with white sugar instead? Hi Jas, you can use white sugar, but you cannot replace baking soda with baking powder as they work differently. Hi, I love reading your blog. You are an inspiration! May I know if I can use vegetable oil instead of butter for this recipe? I'm hoping to engage a group of children (P4 to P6) for baking. This recipe looks like something they would like. As I don't have experience baking with children, what do you think would be more achievable for them? Hope to have your advice pls! Happy Homebaker, thank you very much for the delicious muffin recipe. I droppped out only the soda. I am not a fan of it, and added 3 tablespoons cacao powder to the dry mixture. Fantastic! I'm seriously eyeing this recipe of yours. 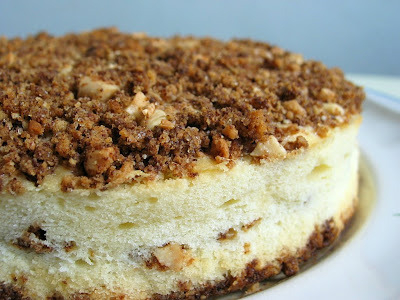 of course i am just in the process of learning how to bake, and bloggin about it. I will make sure that this will be one of the first recipes I make!!!! hi, may i know how many days can i keep these muffins until they are rendered as unsafe for consumption and what are the ways to keep them (eg place them in the refrigerator or airtight container)? Hi mich, you may keep the muffins in air tight containers under room temperature for not more than 3 days. For longer period, you may want to freeze them in the freezer. Came across your blog and just love your photos. Very professionally taken and we're happy to know that there are people like you out there who are so passionate about baking :) We think you can open a bakery shop very soon! Where do you get these paper cups that you use all the time? I know you got the ones from the Blueberry Crumble Muffins from a friend, but do you know where she got those also? Hi Eileen Li, I got my paper cups mainly from Phoon Huat or Sun Lik. Those that were given to me by my cyberfriend, she bought them in Hong Kong. Hi eileen, I'm afraid you can't replace butter with yoghurt, you can try replace it with vrgetable oil such as canola oil. Your muffins look lovely. I deadly want to try it but I want to add some rolled oats as well. Can I replace half the amount of flour by oats? Is any change in the amount of milk required if I do that? Thanks in advance. Hi Bora, I am not able to advise on this, the texture maybe affected. Hi, you have a great blog and thanks to it, I actually picked up baking and had baked the muffins using this recipe twice. But I am facing a problem and wonder if you have any advice to solve it. On the first try, the bottom and sides were charred even though the muffins tasted good in the middle and top parts. Initially, I thought that the charring was because the paper cups were too thin, so I bought thicker paper cups that looked like those you were using. On the second try, the charring was not as bad as the first try but the muffins were still charred at the bottom and sides even though the taste was good for the uncharred portions. Would you be able to advise on the solution for the charring? Thanks. May I ask what kind of baking pans are you using? I suspect you are using those black, non stick pans? They tend to gain heat faster, so probably that was why the bottom and sides got burnt. Are the heating coils of your oven located at the bottom of the oven? If yes, you can try bake at a higher rack position so that the bottom of the muffins are further away from the heat source. Or, maybe you can adjust the lower bottom heat? If not, try bake at a lower temperature, and do use an oven thermometer to make sure that your oven is not too hot. Hope this helps. You were quite spot-on. I was using a 6-hole (cup) muffin baking black, non-stick pan to bake the muffins. I didn't know that this type of pan gained heat faster. Do you think it is a good idea to just leave the paper cups (since the cups were thick enough to stand by itself) on the stainless steel grill that came with the oven during baking without using the muffin baking pan? My simple oven has top and bottom coils. I cannot adjust the temperature of either the top and bottom coils but I can choose to turn either the top coil on or bottom coil on or both top and bottom coils on. And I only turned the bottom coils on during that two occasions. Could it be that I need to turn both top and bottom coils on when baking muffins? Hi Whale, I do not own a muffin pan, I baked mine using paper muffin cups, placed on normal baking tray. I think if you turn off the bottom heat, maybe it would work...but then, it really depends on your oven...you may need to experiment a few times to get to understand how your oven functions. all the best for your next batch of muffins and Merry Xmas! Hello, I've seen lots of Banana OR Banana + __ muffin etc. recipes requiring vanilla extract and cinnamon. Does these two ingredients make alot of difference? Hi, Amirah, you can't leave out the banana in this recipe, but you can do away with the chocolate chips though. It looks delicious! I've never tried adding chocolate to banana muffins before but will give it a try.